Sometimes these types of things are so much more anti-climactic than you hoped they would be. I would have never gotten to the place I am without so many people around me. Leaving for California in three weeks has left with conflicted emotions. There’s a constant cloud of sadness over my head in the anticipation of leaving my real family, and my school family. All of whom I will miss terribly. However, life is giving me new opportunities for adventure and success, so, I must take them. And what better place than beautiful Northern California, where the hills are so steep that I can’t even ride my bike up them and kelp forests call me to the chilly sea? Never be scared to ask for help or admit that you were wrong. You can learn a lot from people when you open up to them. Stay at the lab until 2 am to finish those last minute experiments before that meeting that you secretly regret signing up to give an oral presentation at. Travel those 5,500 miles to present at a meeting that you’re not even sure if people care about your research because every little bit helps. No matter how expensive it is. So, goodbye BORG and ODU. It’s been real. And wonderful! Seagrasses’ relatively low capacity to exploit HCO3 as a source of dissolved inorganic carbon (DIC) for photosynthesis forces them to rely extensively on CO2(aq), which is typically present at low concentrations in seawater. 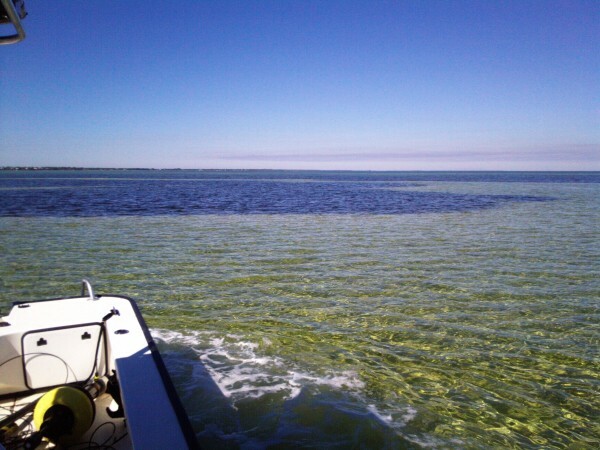 As a result, seagrass photosynthesis is generally carbon limited. This study investigated the influence of CO2(aq) transport to RUBISCO, controlled by environmental and physiological mechanisms, on photosynthesis, and the impact on seagrasses stable carbon isotope (δ 13 C) composition. Light saturated photosynthesis (PE) was measured at a variety of flow and DIC regimes to understand carbon uptake at the leaf level, boundary layer conditions, and permeability of the unstirred layer. PE was saturated with respect to increases in flow above ~2.3 cm s-1. The non-linear response of PE to [CO2(aq)] was used to predict the maximum physiological photosynthetic rate (Pm). Stable carbon isotope signature for light-saturated conditions was modeled from the theoretical relationship between PE/Pm and physiological responses to [CO2(aq)] and flow that drive changes in fractionation. Predicted δ13C for flow saturated, ambient [DIC] was ~7‰, well within the range of reported values for seagrasses. Measured δ13C values from the Goodwin Islands were lower than predicted light saturated δ13C. However, when historical epiphyte loading was taken into account, δ13C signatures agreed with published values from similar light-limited environments. The ability to accurately model productivity and δ13C of seagrasses suggests a comprehensive understanding of the influence of light, carbon acquisition, and environmental conditions on photosynthesis.